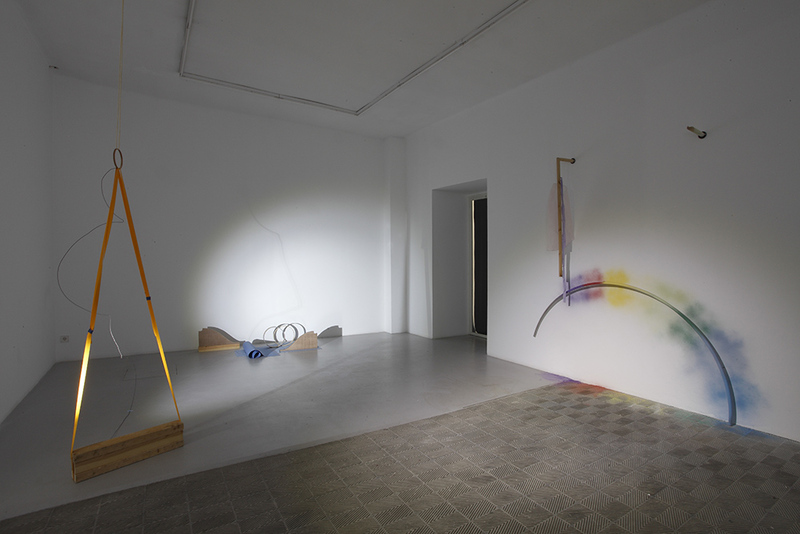 Ellen Mara De Wachter: This exhibition has its origins in your chance discovery of a book outlining mimetic theatrical techniques from the Renaissance, from which you have taken the titles of the chapters in your video Limbs Describe Curves (2015) and of various sculptures. The ‘How to…’ formula reminds me of all the self-help and instructional books and videos available to those who want to improve themselves; very pragmatic and perhaps even mundane. Yet, in the context of this book and of your video and sculptures, ‘How to…’ becomes a call to imagine something more poetic and abstract. So, if I may adopt the strategy of the book, can you tell me ‘how to’ negotiate between these two attitudes, the practical and the poetic? And how do you translate between mediums, as you have done between a technical manual and bodily movement which we see in the video? Leonor Serrano Rivas: I consider the book as a guide to imitating nature, although it was written as a manual for scenography. Theatre has always been the medium in which nature is represented and controlled through a narrative on stage: deus ex machina. So, when I first jumped into the book I thought that I had found a magician’s manual and I had the opportunity to play with it and do the tricks. As you said, in the work I have played with translating this text into something else, into other mediums such as performance and sculpture. We could think about this magician’s manual as a collection of rules with which to compose a play. In this respect, action is subordinated by the script – or by the text written in the book – and it is through the definition of these limitations that a self-contained universe is created. The work is then a game made using self-help instructions and it produces a space parallel to ordinary life which replaces ordinary life for a short period of time. It grows out of the need to find or generate a response within the limits set by the script. EMDW: Do the performances in the video have the potential to be performed live for an audience, or is it essential for them to be edited into a video? LSR: The video introduces us to a parallel space, a rehearsal, which is understood as a mise-en-scène. 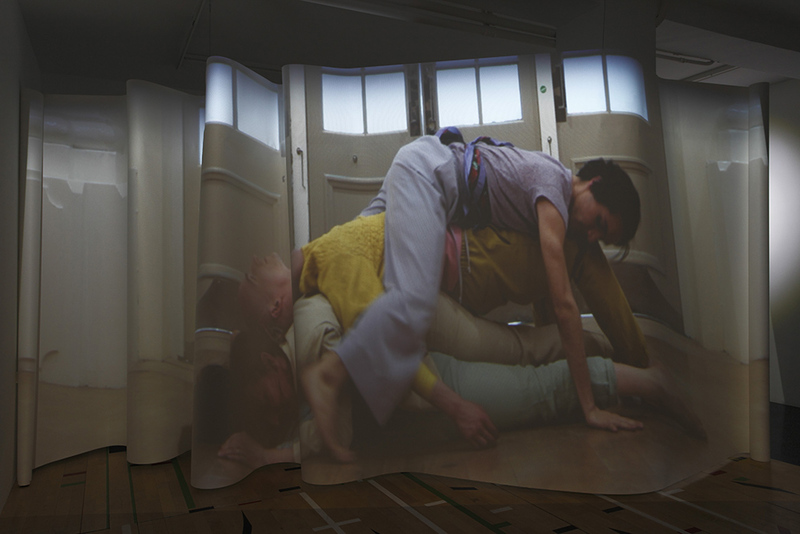 This action could happen live or within the site represented in the video projection. When I first conceived the installation I wanted the video to be the main piece, but also to act as a backdrop or stage curtain of the exhibition. So that viewers, who might also want to act, could enter into the exhibition and have a sense of stepping onstage. It’s like the Brazilian theatre director Augusto Boal described when he said he aims ‘to change the people into subjects, into actors, transformers of the dramatic action’. I am aware that this turn usually won’t be a physical one but the video aims to bring temporal realities into play by suggesting multiple representations and experiences of the world. The movements and shapes as representations of nature create a scenography, the backstage of a non-written action. In this sense, I can easily imagine a live ongoing performance maintaining the same characteristics, with performers or dancers interpreting the chapters simultaneously. In fact, this idea came up during the shoot. I thought in what would happen if I had the backstage and the stage overlapping. So for example the recreation of the wind and a man turning into a rock could be happening at the same time. EMDW: The sense of rhythm and repetition produced by the video, along with a number of other aesthetic decisions you have made, such as the pastel colours of the costumes and the semi-darkness in which you installed the exhibition, produce the feeling of walking in a softly remembered dream. There is a surreal aspect to the space, which evokes the sense of magic that Renaissance theatregoers must have experienced when they visited plays in which, for instance, they were shown ‘A Paradise’. Yet this dreamlike magic is created with the most primary element: the body. Do you have a particular perspective on the use of the body as a material or a tool in your work? LSR: Bodies onstage are the original protagonists of plays. The main character is normally accompanied by a scenography that creates the context in which action takes place. I wanted to invert this order: I thought that if the scenography was produced by bodies, whose action turns them into an anonymous chorus, then there could be a scene (or succession of scenes) without protagonists. 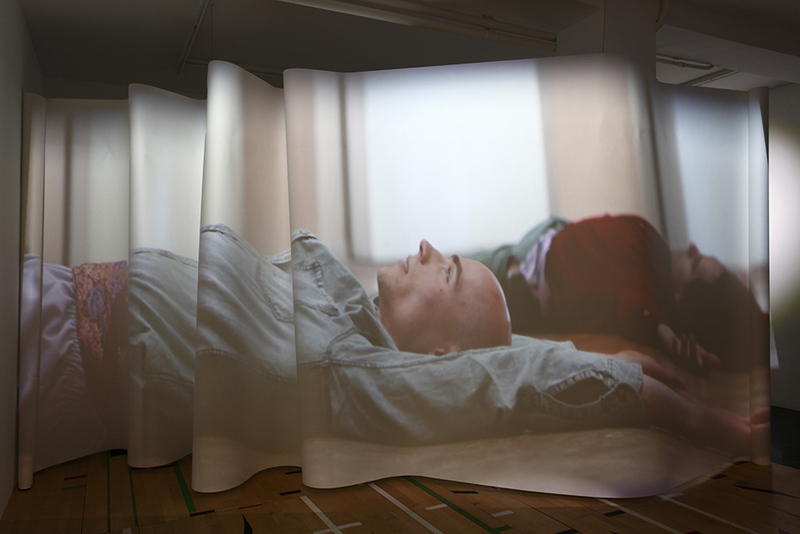 In my video, bodies are transformed into a constantly moving stage setting so that when someone enters the scene (the exhibition) he or she is immediately on a stage. I consider the spectators characters, and the work is a stage setting that moves around them, inverting the traditional roles of performer and audience, and inviting the viewer to be part of the cast. EMDW: The repeated movements, used for example to create a rainbow in the sky, made me think of philosophical discussions around the impossibility of exact repetition and the inevitability of difference at the heart of repetition. Is philosophy important for you in the realisation of your ideas as art works? LSR: I consider repetition in relation to theatrical performance and the everyday. We can think, for example, about how ‘make-believes’ are involved in the existence of repetitive realities, as when dancers perform a symbolic action. Richard Schechner makes a distinction between ‘make-believe’ and ‘make-belief’. Make-believe games are activities comprised of acting as if you were something else. In this sense, the player is perfectly conscious that he or she is pretending to be someone else. When this game overlaps with reality, Schechner calls it ‘make belief’ because these ‘performances intentionally blur [the] boundary’ of an everyday reality. The rehearsal of life through repetition could also be understood as mimicry: the human capacity to build bridges between the self and other selves or things. 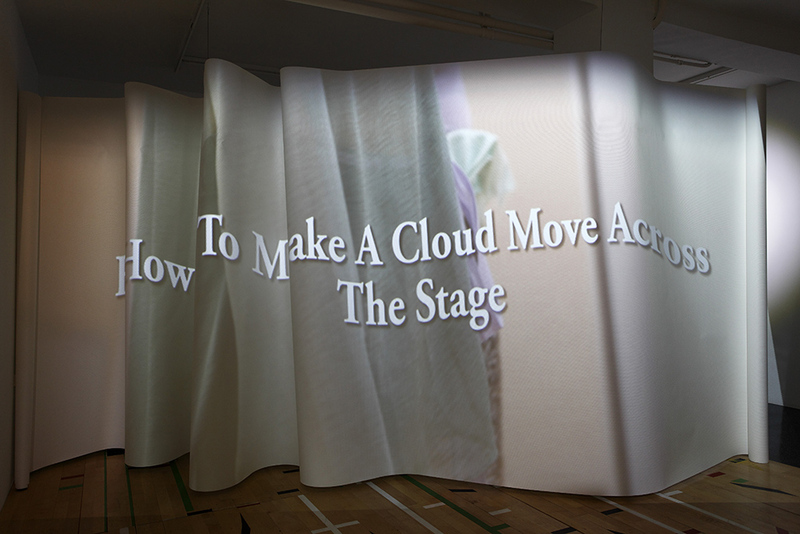 The actions, movements and diagrams presented in my exhibition can be seen as attempts to imitate nature: ‘How to Imitate the Wind’, ‘How to Make a Thunder’, ‘How to Make Heavens in Sections’ and many others. But performance occurs on the border of reality and is presented as a breach in reality. Actors rehearse symbolic actions and through performance these are presented as a connection between fiction and reality. For me, it would be hard to imagine that actions taking place during the rehearsal don’t have any effect outside of this fiction. The rehearsal space works as a try-out space for life. EMDW: Some of the movement allegories your performers create are archaic now, alluding to paradise, heaven and monsters. It is interesting to look at the shapes the bodies make and to disassociate them from the instructions read in the audio that is part of the installation. For example, ‘How To Transform A Man Into A Rock Or Similar Object’ for me carried a potentially darker significance, perhaps a pile of injured bodies. This may be due to the constant stream of shocking images circulated by the media, yet it is also true that bodies have a devastatingly real aspect and I wonder whether this duality is of interest to you; this notion that dreams or fantasies can sometimes turn to nightmares. LSR: Indeed. In the course of the consideration above, make-believes present actions delivered by the performers in the first person. Their ambition is to escape from themselves and become others. As Roger Caillois wrote: ‘Play can consist not only of deploying actions or submitting to one’s fate in an imaginary milieu, but of becoming an illusionary character oneself, and of so behaving’. When performers cannot make a distinction between reality and fiction, an interruption occurs in their personality (and maybe also in the spectators). This effect of being unable to distinguish from one’s surroundings could be taken to the limit, with the result being the creation of a ‘dark space’; in other words, when dreams become nightmares. When performers engaged in mimicry are unable to distinguish between perception and representation, a disorder of personality and space might occur. In this case, perception is understood as the space outside the game and representation of the fictional space where the rehearsal takes place. I think of the chorus as an accumulation of interdependent individuals working as a unique organism, as a sculptural composition. The components of the chorus no longer present a distinction between individuals and the group. The chorus wants to be perceived as a whole through the integration of each member’s rhythm in the scene. They unite as a common body, a group that works together and moves according to a script. When actors are overwhelmed by their surroundings (space or other members of the group) a mental disorder to do with the relationship between personality and space can occur. If we understand schizophrenia as a phenomenon that creates an effect produced by an action of mimicry, the production of a ‘dark space’ where the subject is permeable to his or her environments could be this nightmare you were referring to. EMDW: The diagrams you have quoted from the Renaissance theatre book are geometric plans that suggest movement and changing directions. But their exact meaning seems quite obscure and hard to pin down. Can you explain how you have worked with these and developed them into a system of performance and sculpture? LSR: The diagrams turn into characters within the stage of the exhibition. In fact, they could function as something that could be continuously rewritten to create an unfinished and constantly metamorphosing performer. The colours and formal arrangements suggest the idea of a plural subject as an alternative way of performing, behaving or being. Costumes also help undo any preconceived ideas that the audience could have about what the characters might be or do in the play. The costumes make the actors look like one another and like other things or objects, leading to the possibility of a single body in motion. The formal aspects of the work can be seen as an indication of the desire to belong to a group or to be part of a specific landscape, which might lead to a disturbance in the perception of space. EMDW: Your sculptures, which carry many of the same titles as the scenes of the video, recall the architecture of bodies: there are stick-like elements that remind me of bones, cords and strings evoking tendons and blood vessels, and skin-like sheets of paper or cloth. Yet, the bodies we see on the video are firm, strong and agile, whereas your sculptures are more fragile, perhaps even precarious. Can you describe the process of making the sculptures? And is there a causal relationship between the sculptures and the video? LSR: I consider them not so much as sculptures but as spatial diagrams. I like to think of them as a temporal prop or a rig. If the book is a magician’s manual, the instructions and diagrams are a guide for making. But they are very abstract, which allowed me to openly interpret them. In this respect, the compositions are not unique but in a process of constant change. For example, ‘How to Make a Rainbow’ could be the title of more than one composition or a constantly changing form, something that mutates over time. In the same spirit, the book is presented as a set of rules or a script, where the limitations are only a starting point for acting and making: a framework that determines a range of possible actions or shapes. EMDW: The video is projected onto a large apparently freestanding undulating paper screen, which intensifies the sense of magic and illusion that pervades the exhibition. The movement of the screen also breaks up the projected image in a gentle but sometimes disorienting way, exactly as dreams break up normal imagery in the theatre of the unconscious into something that is hard to describe or to grasp. What is it about this fantastical state of not-quite-knowing that interests you? LSR: I am interested in how the exhibition can grasp the everyday through the creation of an illusion that can stand on the edge of reality. I propose an illusion, which rigorously adheres to its own rulebook (its script) and involves an action of mimicry (make-believe: ‘How to…’). This game is a representation of a self-contained universe, just like drama implies the imitation of an action or event. But this representation or imitation is not a mere copy: it creates a space that has its own life. This entry was posted on September 18, 2015 by ellendw.